2016 reliability - extended warranty worth it? Re: 2016 reliability - extended warranty worth it? I tried to trade my bike in yesterday when I got the water pump leak (hopefully) fixed... But they were undercutting the value of the bike so badly I couldn't justify doing it, lol. Including you, me and two other people I know that’s four people offered poor trade in values in the last few weeks - factor in the time of year and the market pretty flooded with second hand and old pcp bikes, the BM is depreciating worse than the GSXS and the MT10 ! Non-BM Dealers obviously know that BM have been overvaluing it’s used price and many of these machines are now finding their way to non-franchised outlets and the private market. 100 percent yes buy an extended warranty!!! I’m not trying to scare you. I’m being real with you. I have owned 2 of these bikes and will always love them. To get down to the cams is essentially doing an 18k in the tear down / labor aspect. That is around an 8 hour job. Most shops labor rates are at least 125$. That is a lot of money and that is not including new cams which are over $1000. Warranty = worth it. 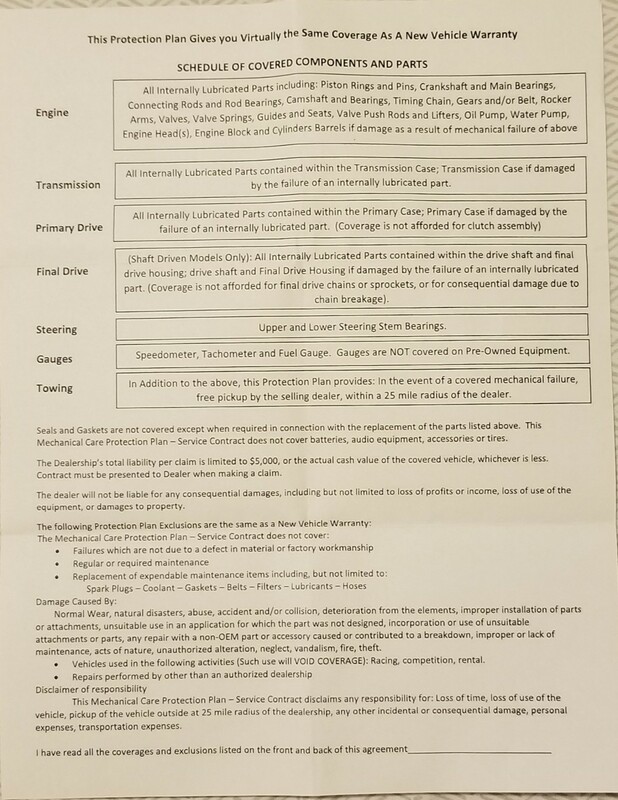 I believe the BMW warranty says it does not cover wear items, so it's not a sure thing they'll pay for your cam or crankshaft that goes out. I've heard, though, that if you've been taking your bike into the dealer for oil changes, and simple stuff like that, you're considered an excellent BMW customer and therefore they'll make exceptions. Cams and crankshafts should not considered wear items. Has anyone's cam/crank shaft warranty claim been denied because it's considered an wear item(like brake pads are)? So I shopped around and found that my local dealer group has their own in house warranty. What are your thoughts on this coverage? . $50 deductible and I can go to any BMW dealership. My only concern is the 6th box; gauges are not covered. And 2nd paragraph below the boxes; total coverage per claim is $5000. What differ this from other extended warranties is that it does not have a sh#t load of exclusions. No, never buy an extended warranty on anything. Put that $1200 in a savings account and don't touch it. 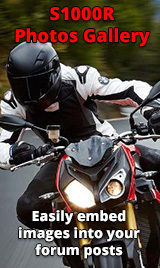 If you ever have any issues with the bike, you can perform the work yourself, or find a reputable mechanic with BMW experience ( not a dealership) and use the money from the account, chances are you will have money left over after 3 years. The key is to average it out. Put the money into savings you would spend on extended warranties on all items you have where a warranty is offered. On any one product a warranty might pay off. But it's a numbers game. Spread across a lot of units the house wins. The people who sell extended warranties know that across a lot of units less will be spent on repairs than is spend buying the warranties. It a profit thing! One thing to consider is if other BMW dealers will accept the terms of the contract--payment offered to do the repair including parts. If you are planning on taking bike to dealer that offers this then you would think it reasonable that they would do the work, but that is not guaranteed either. Yes in general its a losing game when you get into extended warranties. However, if you do have an issue then the $1200 you put into a savings can get eaten up pretty quickly. ie; brake warning light on. Say it turns out to be an ABS sensor. To get it repaired it would be 1 hour of labor for diag, 1 hour of labor for replacement, and the $163 part. In my area that job would have costed me $403 for a simple sensor. I ended up purchasing an extended warranty that is backed by my local dealer group. $1000 for 3 years unlimited miles, $0 deductible. The terms read basically the same as the factory warranty.